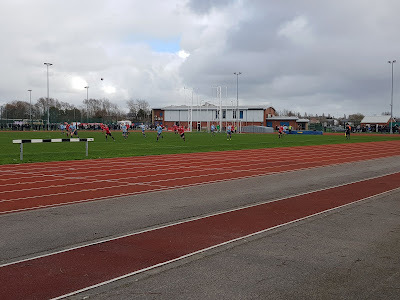 My eighth ground of 2019 was on Saturday 9th March at Litherland Sports Park in Litherland, Merseyside. 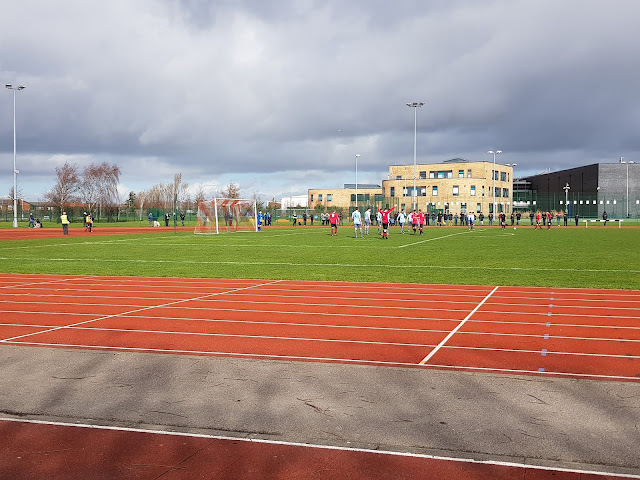 The match was Litherland REMYCA vs. City of Liverpool in the North West Counties League Premier Division. The football arena forms part of the a sports park in the Litherland area of Merseyside. In addition to the main pitch the complex has grass and artificial pitches, a cycle track and a main building containing fitness suites and conference rooms. These features combined with several schools on the parcel of land border the football field to the south, east and west with a cemetery on its northern flank. The area is well served transport wise with four Merseyrail stations (Seaforth & Litherland, Orrell Park, Aintree and Old Roan) within two miles of the complex. The venue is as athletics venue so has a track encircling the pitch varying between six and eight lanes. A number of structures have been added to the western side of the ground starting in 2014 when a 50 seat structure was added to comply with Step 6 gradings. Adjoining this is an additional section of the same size consisting of uncovered terracing - this stand does have the frame of a roof in place so should become covered in the future. Just to the south of this is a covered terrace stand, once again of the same size as the all-seater one. 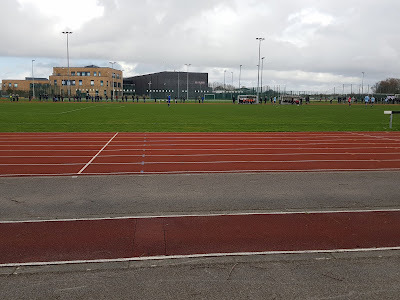 The western side is a long way from the pitch as it is separated by the widest part of the running track (at eight lanes) as well as the long jump area. The remainder of the ground is uncovered standing. There is a strip of hard standing the whole way round with wide expanses of grass behind this to accommodate spectators. The two dugouts reside on the eastern side while the northern side has a food outlet building. More facilities are contained within the main leisure building. City of Liverpool went into the game top of the table - with their rivals, and landlords, Bootle FC winning the early game of the day they knew another win was required to keep their lead at five points. There was very little to say about the the opening half other than it was a poor show. 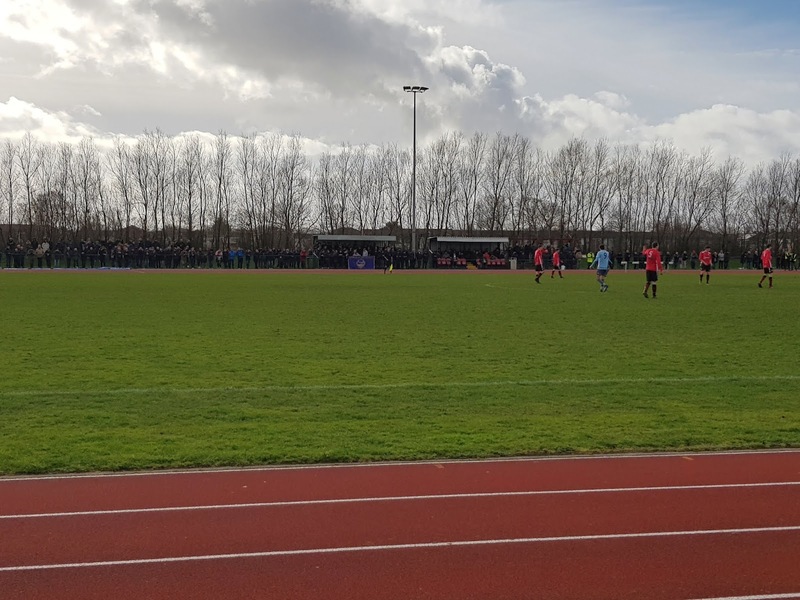 The first meaningful chance came after 25 minutes when Litherland's Declan Gregson went on a good run down the left, advanced into the area and shot straight at City of Liverpool goalie Ben Ascroft. As the game ticked past 45 minutes Paul Foy smashed a speculative shot at the City goal from 25 yards. On the way through it hit the arm of namesake Francis Foy and the referee pointed the spot. Paul Foy was on penalty duties and sent the keeper the wrong way to put the hosts into a surprise lead. Just after the hour mark the away side got on level terms. 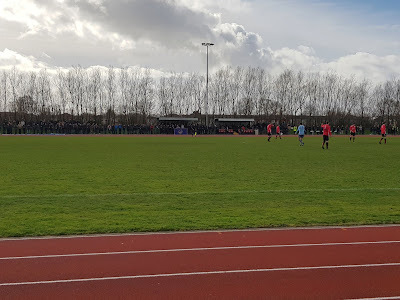 A Francis Foy corner was punched away by Litherland goalie Travis Wilson but landed at the feet of Daniel Dalton who smashed the ball through the crowd and into the back of the net. A couple of minutes later the hosts went close to restoring their lead when they were awarded a free-kick 30 yards from goal. Everyone was expecting a cross but Jamie Britt went for goal seeing his effort come off the top of the crossbar. In the 72nd minute the visitors got their noses in front for the first time in the match - Kevin McEllin lofted a ball from midfield which put Karl Clair in on goal. Clair had time to control the ball and shoot past Wilson in the home goal. After this the game became a bit tetchy and there wasn't too much more in the way of goalmouth action with City of Liverpool securing a 2-1 win.